2010 sees big payoffs! Plus, my goals. Well, not quite yet, but I’m guessing working like a working-very-hard-person in 2009 will pay off at some point, in terms of reaching my goals, if not cash (have I mentioned, writing doesn’t pay too well?). Which brings me to my goals. I started my adult life with two goals, neither of which I thought would ever bear fruit. One was to be a writer. The other was to be a rock star. In some ways I’ve achieved them both, although I spent most of my teenage years and twenties lamenting that I hadn’t come anywhere near it. I’ve written a book, and it’s being published. I’ve played in a couple of much-loved local bands, so you could say I’ve had at least a micro-taste of what it feels like to be a rock star. This book has given me so much more than ticking an item off a list. I’m starting to think of myself as a writer. Finding myself looking for more opportunities to write, and thinking about my next big project, I’m plotting how to make this a full-time gig. I can put in the hours. I could really do this. Coming up: I’m being interviewed for Melbourne’s queer radio station Joy FM 94.9 tomorrow, for the Southpaw Grammar show, 12-2 on Tuesdays. I’ll post a link when it’s broadcast. 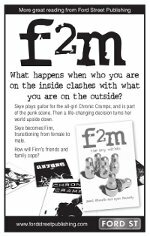 Cool promo ad: Paul from Ford Street Publishing has sent us this cool black and white ad for f2m:the boy within which will appear in future books. Thanks! This is SO exciting! I can’t even imagine how grateful I’d be to have had something like this to read growing up, I can’t wait to read it – it looks amazing. Plus, ‘There’s a Hippopotamus on Our Roof Eating Cake’ was totally a childhood favourite of mine, yay for Hazel Edwards, yay for you. It is quite exciting! I pretty much wrote the book I would have wanted to have on hand at the start. If I’d read this in my teens I might have transitioned at 17 and not 27. No regrets though. Congratulations on the book. Hazel told me ages ago she was working on this, and I’m glad it’s on the launch pad. Hazel mentored me for a while on my own first novel. She’s a powerhouse of a person and great to work with. My own book is also a bit of a rare one – a YA novel about child sexual abuse. And with Ford Street to boot. Paul Collins is another powerhouse person who doesn’t get scared off by controversial topics. I hope the book sells well. Enjoy the ride. Thanks, I’ve found Hazel great to work with as well. This was baptism-of-fire mentoring for me since we had what I considered quite a tight deadline! I’ve checked out the other Ford Street titles and will hopefully pick up some titles when I come over for the launch in February. Yours stood out as one I’d like to read, and I liked the video as well. ‘Crossing the line’ was also a full-on story. I prefer to read (and write) realistic stories that push the boundaries and need to be told. I’m Ryan’s wife, and I read mostly young adults and your’s looks absolutely awesome I’m a survivor of child abuse; physical, psychological and sexual… I just wanted to say I’m going to go buy it now, and can’t wait to read it, and wish there had been a book like that when I was younger. Hey, I’ve just had another thought. (Two in ten minutes is a bit rare for me) That B&W promo page for your book that you’ve got up there? If you look in the back of your book you should find a similar promo page for my book. How cool is that?